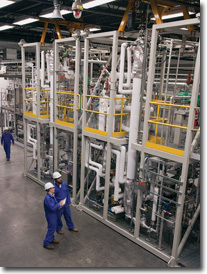 A demonstration plant set up by Virent Energy Systems in Wisconsin-supported by strategic partners and investors Shell, Cargill, and Honda-is using the company's patented BioForming platform technology to convert plant sugars into biogasoline. With the Gulf of Mexico oil spill still so fresh in people's minds, some of the great stories coming out of the fuel industry haven't received the attention they deserve. 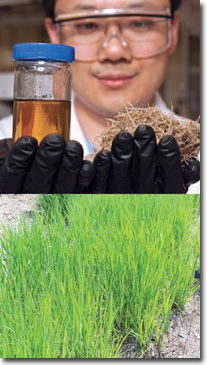 One such story is the start up of the world's first biogasoline production plant. Virent Energy Systems and Shell have introduced innovative technology that's taking biofuel production to the next level. Traditionally, sugars have been fermented into ethanol and distilled to create biofuel. But Virent, headquartered in Madison, Wisconsin, has developed a patented technology, the BioForming process, that uses catalysts to convert plant sugars into hydrocarbon molecules, identical to those produced at a petroleum refinery. This fuel is not only high energy and premium quality-102 octane-it can be blended seamlessly to make conventional gasoline or combined with gasoline containing ethanol. The groundbreaking technology takes it a step further. The sugars needed to create the biofuel can come from a variety of feedstock-corn stover, wheat straw, sugarcane bagasse (the fibrous residue of sugarcane), and beet sugar, in addition to wheat, corn, and sugarcane. Earlier this year, Virent announced the start of production at their Eagle demonstration plant, located at Virent's Madison facility. The first-of-its-kind plant has the capacity to produce up to 10,000 gallons of biofuel a year. "In the R&D labs, we were making roughly one liter a day of gasoline from sugar," says Virent's CEO, Lee Edwards. "The Eagle facility is an important milestone for the company in that it validates the engineering scalability of the technology. It also gives us a great deal of operating knowledge and confidence that the overall performance of the demonstration plant can be converted to full commercial deployment with effective economic returns." Shortly after start up, the demonstration plant was already ahead of schedule in terms of production volume. The fuel will be used for fleet testing. One of the most unique aspects of Virent's cutting-edge process is that it is both a fast, and a continuous, conversion of soluble sugars, unlike many competitors that use a batch system. "In roughly an hour-and-a-half, we will have gasoline coming from the back of the reactor after sugar water has gone into the front end," says Edwards. The process is also a clean one. Byproducts (besides gasoline) include process water and a small amount of renewable gaseous products-methane, ethane, and propane. 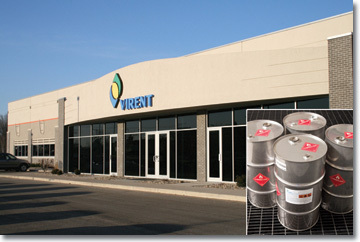 Virent uses the gases as a process energy source for the overall reaction in the first application. And the water is reused as well. "We actually end up with more water at the end reaction than what goes in at the beginning," explains Edwards. The water does, however, need to be processed in a treatment facility before it can be recycled. The Eagle pilot plant is under the same roof as Virent's R&D laboratory where they continue to test and validate the process on a number of different feedstocks for the system. "A big advantage of this BioForming conversion process is that it's able to process soluble sugars from a wide variety of feedstock materials," says Edwards. "It's not an enzymatic fermentation pathway-it's a catalytic chemistry approach, which provides a great deal of flexibility on the feedstock sources." In addition to conventional sugar sources such as sugarcane or sugar beet, all plant material contains cellulose and hemi-cellulose that can be broken down into soluble sugars that can be processed using Virent's technology. With materials such as woodchips, a pre-treatment step to break down the cellulose and hemi-cellulose is required and adds to the feedstock cost. Because the fuel product must compete on price with petroleum fuels, the use of woody products as feedstock depends in large part on the future prices of gasoline and diesel. Edwards believes that the BioForming technology is one of the long term answers for the industry because its feedstock flexibility enables it to utilize more of the sugars in the feedstock, thus increasing fuel yields. "We are working to develop methods to break down a variety of plant materials to basic soluble sugars at a cost-effective price point relative to commercially available sugars today." Once soluble sugars are processed, the biofuel is a mixture of molecules that you find today in your gasoline tank. In fact, from a chemistry perspective, they're identical to molecules that you get from converting crude oil into gasoline. The only difference is these molecules are coming directly from plant materials. Because of the identical molecular structure, Virent can blend the biofuel with petroleum-based fuel at much higher percentage rates than can be done with ethanol. "We've demonstrated the validity of our product blending from 10 percent to over 50 percent," says Edwards. "We've also run engines at 100 percent. But to meet specifications and to optimize the commercial value, we believe our product will be blended with existing gasoline, but at a very high percentage-much greater than 10 percent, which is the regulatory mandate for ethanol today." Producing both a high-density fuel-120,000 BTUs per gallon to ethanol's 76,000 BTUs per gallon-and one that's blendable at high rates, gives Virent a commercial advantage. It can blend the biofuel with base stock gasoline creating the premium or regular blends in demand today. Virent is also envisioning their product will enhance the biofuel industry. Currently, the cheapest source of soluble sugar is either from corn or sugarcane. But Virent is banking that by creating the technology that uses both conventional and non-food plant sugars, they will be able to create their biofuel cost-effectively and enable advanced biofuels to achieve broader acceptance and commercialization in the transportation fuel marketplace. Virent appears to already be ahead of the game. "At today's crude oil prices-around $70 to $80 a barrel-we can compete," says Edwards. "And that doesn't include the environmental benefits of reducing the amount of carbon emitted into the atmosphere. So when you look at the total package, the environmental improvements, great flexibility on feedstock, and local job creation, without some of the risks associated with extracting hydrocarbons from beneath the surface of the earth-I think our technology and several others would have a great opportunity long term to help the world." Another advantage of having biofuel made of the same molecules as petroleum is that it uses today's existing infrastructure. It can be transported through existing pipelines, stored in existing distribution centers, and used by existing pumps at gas stations. It can also be burned across a wide range of vehicles-from cars and boats, to lawnmowers and jet skis. In fact, the company is conducting research and development for distillate products including diesel, which is used to fuel trucks and trains. "The economical conversion of plentiful cellulosic biomass into renewable, fungible hydrocarbon fuels is the most realistic alternative to create a clean energy transportation sector in the coming years," says Edwards. "Progressing biomass deconstruction to provide inexpensive cellulosic sugar feedstocks is the final hurdle to achieving a complete and sustainable biofuels solution," he added. Virent is getting much deserved praise for their hard work. It has received the U.S. Environmental Protection Agency's Presidential Green Chemistry Challenge award, the World Economic Forum's Technology Pioneer award, and the 2008 ICIS Chemical Business innovation award. In addition, this February Virent was awarded $2.4 million from the U.S. Department of Energy as part of a $33.8 million grant to the National Advanced Biofuels Consortium (NABC)-funds that are assisting them on the road to the commercial marketplace. The next step will be scaling up the process. If all goes well, customers could see the biofuel in gas stations as soon as 2015 and, conceivably, a full commercial plant within the next five years. "We're still in the early phases of the engineering design," says Edwards. "We're working on location and size, and that will really drive the ultimate timeline and where the product will be available first." In the meantime, Virent will continue to work closely with their strategic partners and investors Shell, Cargill, and Honda. "We think we've got the opportunity for a truly breakthrough technology that will deliver products that consumers enjoy today without negative environmental consequences," says Edwards. "A technology that can be deployed in a number of different configurations around the country and the world."